Experience tells us that the long term success of your ERP project is largely determined by the first year. 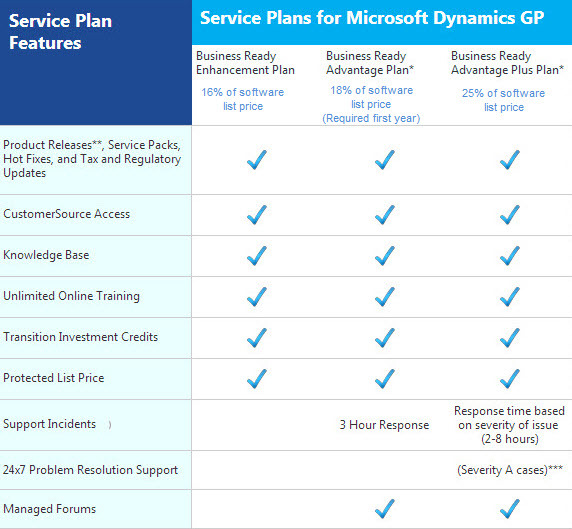 This is why Microsoft requires that new customers buying Microsoft Dynamics GP enroll in the Business Ready Advantage Plan (Annual Maintenance Plan). With this plan you receive automatic access to product updates and the CustomerSource portal along with six technical support incidents and unlimited online training services. The cost of this required program is 18% of the Dynamics GP software list price and should be factored into your total ERP software project budget. After the first year you can choose between several optional maintenance plans ranging from 16-25% of the software list price. Receive all major releases, minor updates, and tax updates for the product you currently own. Give your employees FREE unlimited access to 24×7 Microsoft Dynamics GP E-Learning, training manuals, and other productivity enhancing training resources. This Microsoft-authorized Web site contains everything you need to know about your product, including personalized product and service information, a searchable knowledge base, downloads, documentation, discussion boards, online training, news, and other features. Knowledge Base is your online source for answers to your technical questions about Microsoft Dynamics products. The articles are created by Microsoft Dynamics support professionals and are available exclusively to customers on a Microsoft Dynamics service plan. You can save money on support costs if you search the knowledge base on your own. Apply full license credit toward a move to any other Microsoft Dynamics Financial Management or Supply Chain Management solution. For example, move from Microsoft Dynamics SL to Microsoft Dynamics GP or from GP Business Essentials to GP Advanced Management and receive a full investment credit for your software list price. Receive 5 years of mainstream support (includes security updates, service packs) for products released after 2005. The Business Ready Advantage Plan offers valuable tools to help maximize the value of your solution, help protect your investment, and enhance employee productivity. Combine this with the support services provided by CAL Business Solutions, and you have a winning combination to give your staff what they need to use their software to its full potential. "With Microsoft Dynamics GP, I have the insight I need to optimize our financial management. For example, I can protect our margins against inflationary pressures by looking at our inventory from different perspectives—not just on a unit basis, but the true cost according to the date we received it."